Apple has released iOS 11.1 beta 5 alongside macOS High Sierra 10.13.1 beta 4 and tvOS 11.1 beta 4. Currently the beta versions are available to developers, but public beta versions are usually available soon after. 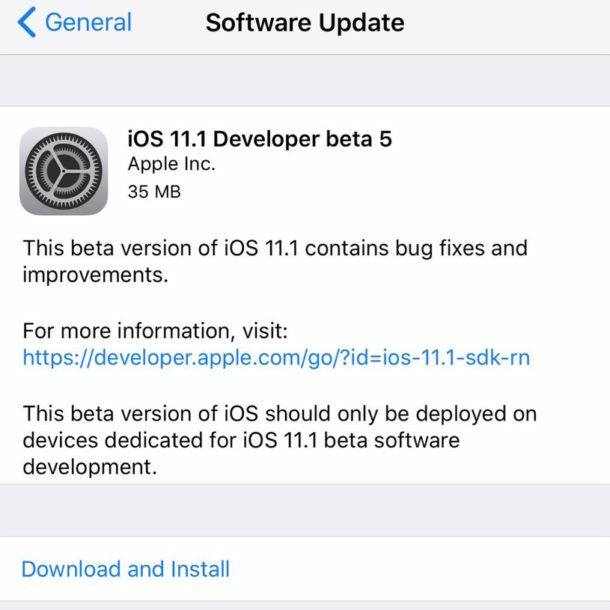 The release of iOS 11.1 beta 5 follows iOS 11.1 beta 4 by a few days, indicating a rapid pace of ongoing development for the software update for iPhone and iPad users. Users enrolled in the beta testing programs can find the latest beta software available now via the Software Update mechanisms of iOS within Settings app for iPhone and iPad, and the Mac App Store for Macs. macOS High Sierra 10.13.1 presumably focuses mostly on bug fixes and improvements to High Sierra, perhaps addressing some of the problems encountered with High Sierra by some Mac users. macOS 10.13.1 will also include the hundreds of new emoji icons too. It is assumed that iOS 11.1 and macOS High Sierra 10.13.1 will debut around the launch of iPhone X in early November, though this is largely speculation as there is no known public timeline for the final launch of the revised system software updates. Emojî’s ! What ! Is a joke ?? Where all the Mac users communauty in all the World suffered by all those crap updates, Apple improuve with Emoji’s ! WTF Apple , seriously ? What is your problem ?? My Problem ? well simple mate ! since more than 2 years, Apple offense his loyal customers by crapy Updates where on 1/2 final user find his machines/devices affected by & for this last Major OS Sytem H.Sierra, apple highlight the fact them add some super top new Emojii’s ! where in the other side a ton of users have them machines Bricked, or low system running, or in total incompatibility and Apple talk about Emojii’s, in the place to fix the amount of urgent issues ! I agree Kevin. Wake-up Apple! @Kefin: I’m with you, man. Apple products are more and more turning into toys for children and teens. We can talk about how they removed time-proven funtionality from Pages such as mail-merge. We can talk about how awkward some of their softare works, like why is the “add a new contact” button in Contacts located within an existing contact. We can talk about how my MacBook flags “MacBook” as misspelled for over a decade now, or dozens of other bugs in their various software. Try this: in ios 11 on your iphone go to “settings” then click on one of the sub-categories, in the upper left, depending on the option you click, it will either show “<settings" or "<back", this is a multi-billion dollar company and they can't make an app with some internally consistent standards. You're seriously correct, fix the urgent issues. Emojis. And stuff like buggy calculator in iOS stays unfixed since years. Don’t understand me wrong, i love apple products, but it gets in wrong direction, since years.